A recent VOA/BIRN report exposed the collusion between Socialist mayor of Durrës, Vangjush Dako, and the Avdyli criminal gang in vote buying. The gang is being investigated by prosecutors of the Serious Crimes Prosecution which is headed by Donika Prela since May 2018. They have not demanded the arrest of Mayor Dako yet. Two days before the report was published, opposition’s Democratic Party (PD) MP Enkelejd Alibeaj made several allegations regarding Donika Prela’s contacts with members of the Avdyli gang while she headed the Durrës prosecution office. Tomorrow, the Independent Qualification Commission (KPK) vetting Prela will decide whether she is fit for office. Prela faced several allegations in her hearing with the KPK, which appear to be a solid ground to dismiss her. Furthermore, opposition’s latest allegations regarding a Prela–Avdyli connection remain unanswered. Did Prosecutor Prela facilitate the kingpin Astrit Avdyli’s release following his arrest in January 2018? Prela headed the Durrës Prosecution office when police found an illegal gun in Astrit Avdyli’s handbag while he was travelling in his car with Donald Çullhaj. The latter claimed that he owned the gun. The prosecution demanded a prison sentence for Çullhaj and the release of Avdyli without any further investigations – even fingerprints on the weapon were not examined. Did Prosecutor Prela have any phone conversation with Astrit Avdyli after police found a gun in his car? 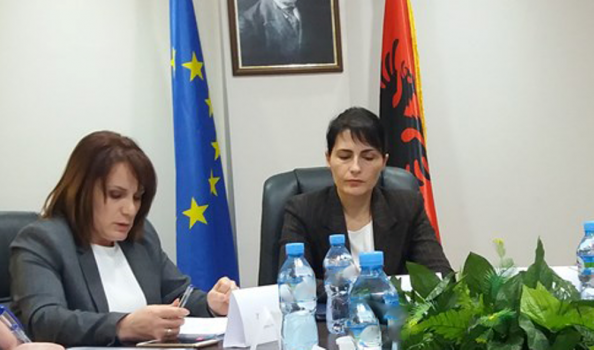 MP Enkelejd Alibeaj’s question implied that the prosecutor and the suspect talked on the phone and were wiretapped. Did Prosecutor Prela influence the two prosecutors Vladimir Mara and Dritan Prençi to make an official announcement that Prela was not wiretapped in phone conversations with members of the Avdyli gang? Prosecutors Mara and Prençi are investigating into the Avdyli gang. Right after MP Alibeaj’s allegations, they were quick to announce that his allegations were false – “[…] we announce that the facts [sic] stated are untrue” – i.e., Prela did not have phone conversations with the Avdylis. It’s not clear why the prosecutors would make a potentially illegal official statement regarding a case under investigation. Did Prosecutor Prela meet with KPK member Valbona Sanxhaktari while she was undergoing the vetting process by the same institution? MP Alibeaj alleged that the two met in the Serious Crimes Prosecution office in November or December, and he called on the KPK to check the CCTV video recordings of the institution. If true, Alibej alleged, this would be direct conflict of interest.